An app that translates sign language and spoken language in order to better integrate people with disabilities. A phone that will help visually impaired people in their everyday life. Converting a variety of litery genre books into audio books by student volunteers for visually impaired people, thus creating audio libraries. An app that enables people to know more and to truly experience the charm of their cities. As a result people are driven to make actions to improve social matters and become urban guardians. Τhe idea of Βlind Walker applies to people with vision impairment , It guides them when they walk and it consists of four cameras, a wireless microphone, a pair of speakers, a built-in GPS and a pair of rechargeable batteries, so that these people are able to "see" their step and avoid obstacles. Their Social Innovation was the Pine-Wrap, made up from Pine needles and Tamarind Seeds. Anak Bangsa is floating library that will be mobile along Musi river and through some schools around Musi river. The concept is a website where students can receive and provide private tutoring. Students will teach other students for free (unlike lessons with a private teacher). Mosquito trap for the low income earners. A machine, constructed within is a simple circuitry as to minimize cost. It has a main mission which is to keep the pests at bay and by doing this allowing the poor farmers to keep their livelihood from being damaged by pests. Instead of dumping and burning the rice husks that contribute to the release of CO2 emissions and air pollutants, rice husks get a second life in BatteRice as it becomes a more eco-friendly and sustainable counterpart to the graphite components of common commercially produced batteries in the market. 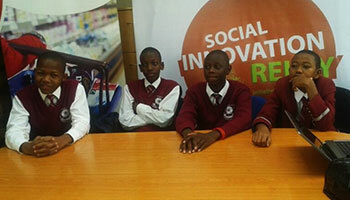 The project addresses the social issue of students’ absenteeism and school dropout. The social innovation the team have thought about is a company that will offer financial funding for the students at risk to keep them in school and to offer moral support. GreenCycle is a state-of-the-art reverse vending machine that aims to increase recycling by incentivising users with instant gratification, and solves the problem of convenience that elderly bottle and can collectors currently face. The team came up with the Table Tablet a tablet computer installed into a school desk, the tablet will be used instead of textbooks. Teachers will be able to upload lessons, homework and study guides to the tablet. Its main objective is to contribute a bit to help solving the problems of our current model of consumption, generated with its spiral of indefinite growth that does not respect the natural limits, seriously harming the ecosystems and the Earth's capacity to ensure the well-being. Turbines connection to the running water pipes to provide cheap energy. This team idea proposes to install turbines within the piping system as a mean to use water pressure to move these turbines.